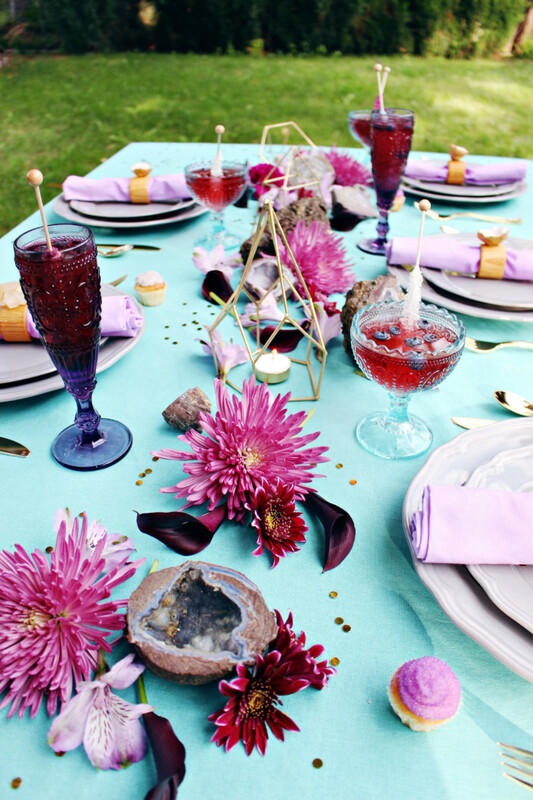 The gorgeous natural purple and turquoise colors of raw geodes inspired this outdoor dinner party. 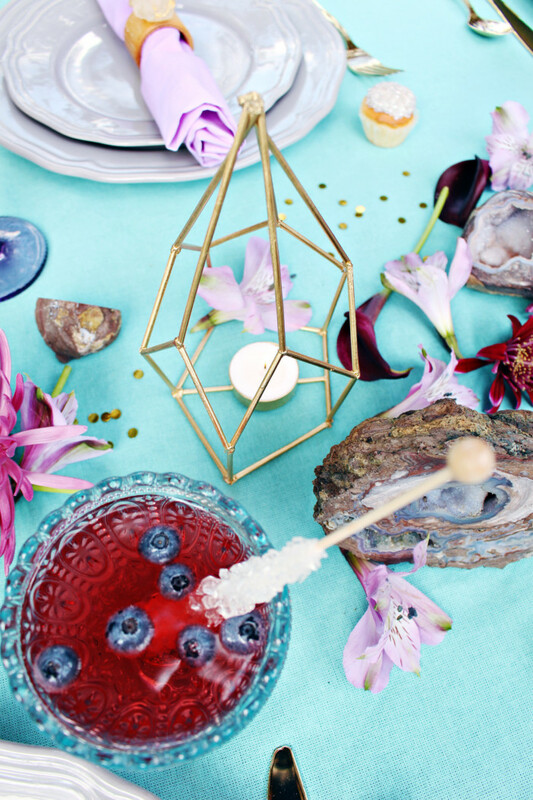 Featuring geometric decor, lots of rock candy and glitzy gold, this party is rich and fresh. A few weeks ago, I was able to celebrate my awesome mom and throw her a little dinner party for her birthday! I didn’t have any grandiose plans at first, I just wanted to make her dinner for once, but then I had this idea for geode cupcakes (post for those to come!). And then I thought, I could use them for my mom’s birthday! She loves pretty rocks! 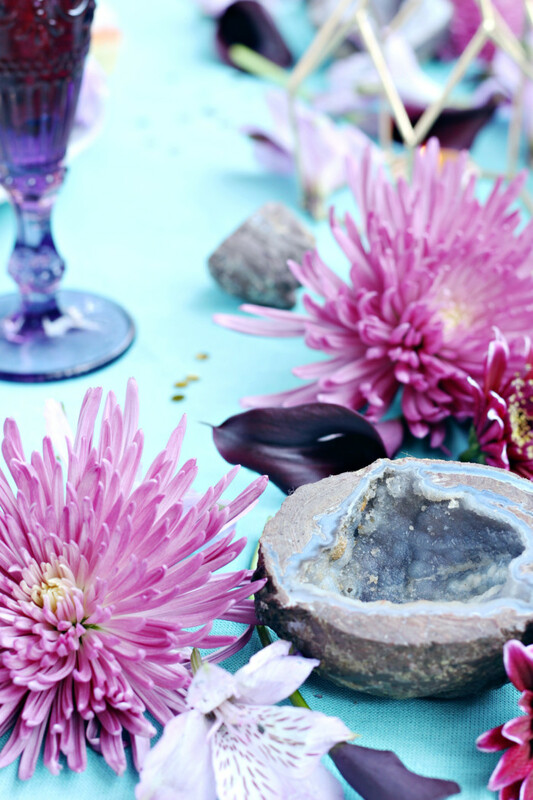 And the ideas for other geode and gemstone inspired decor just started coming. And I thought, why pass up an opportunity to make a big fuss? 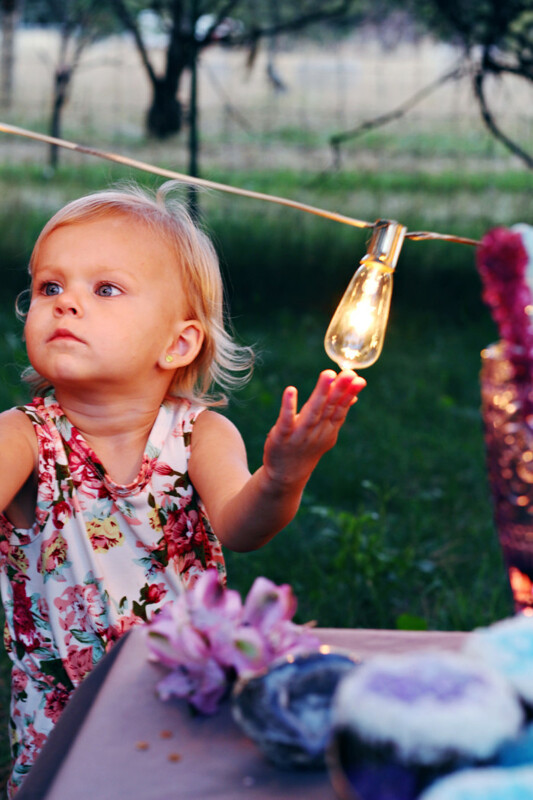 I love to throw parties, especially for closest loved ones. 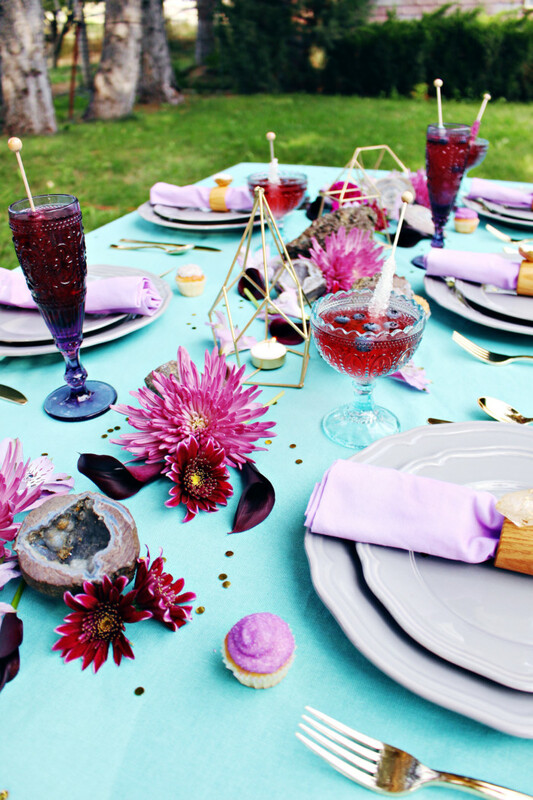 So I went with it and this glitzy-ish outdoor dinner was the result. When I say my mom loves pretty rocks, I mean I remember many trips out to obscure places to hunt for things like trilobite fossils and mochi marbles. My mom loves searching the beach for shells (k, yeah, not exactly rocks but you know..same kind of genre haha) and she used to have buckets of them in the garage. My parents still take day trips to collect petrified wood. And, up until recently when it broke, she would polish all kinds of rocks in her own little tumbler. Maybe she doesn’t have a huge collection, and she would probably never spend money on a rock, but pretty stones definitely remind me of my mom. 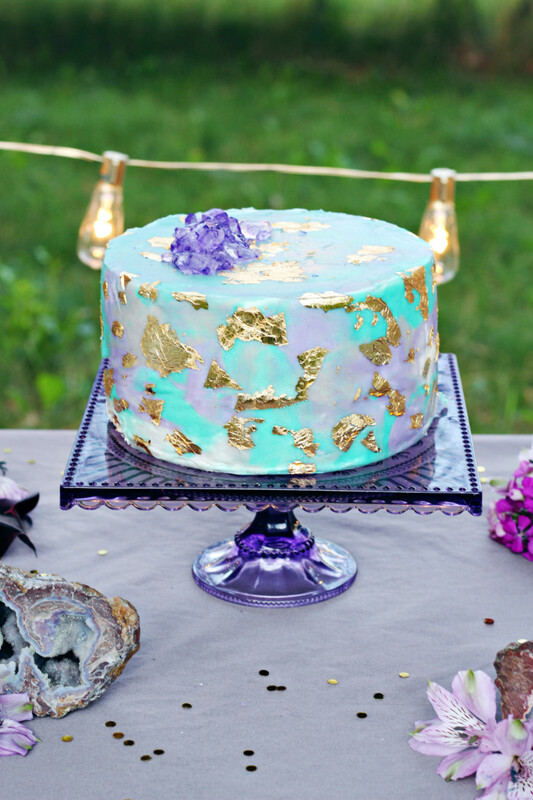 So I figured she wouldn’t mind a little party inspired by some of the most amazing rocks around, geodes. Seriously, these rocks kill me! They are just plain-jane gray and ugly on the outside and then you bust them open and a world of sparkly gorgeousness is revealed! I absolutely love their waves of swirling color and caverns of glitz. So I decided to expand on that and include a few other gemstones and some gemstone-shaped decor. Everything was purple, turquoise, gray or gold and I love how those colors when together. And did you see that amazing cake?! 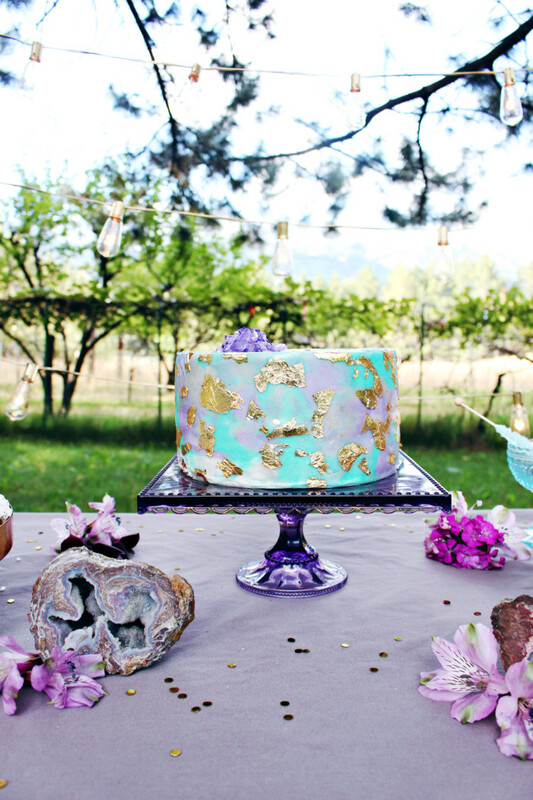 The Sweet Tooth Fairy provided us with that gold-leaf work of art (that was so delicious too btw!) 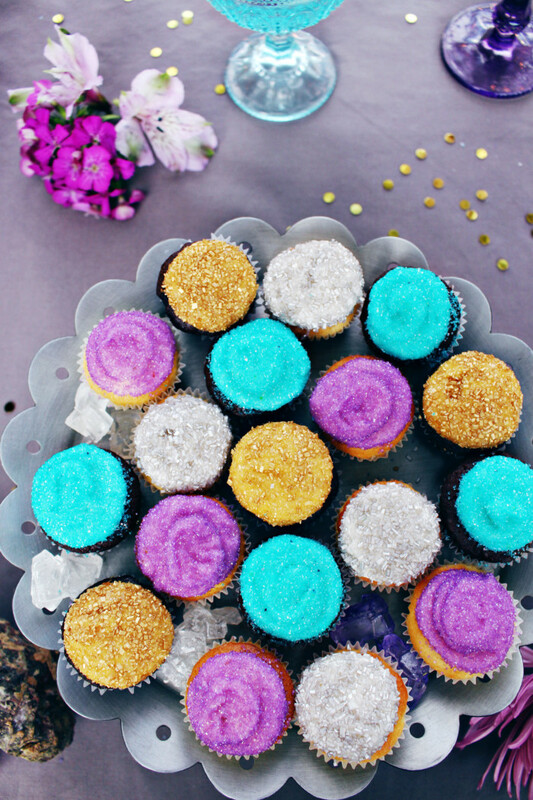 as well as some fabulous, sparkly mini cupcakes! 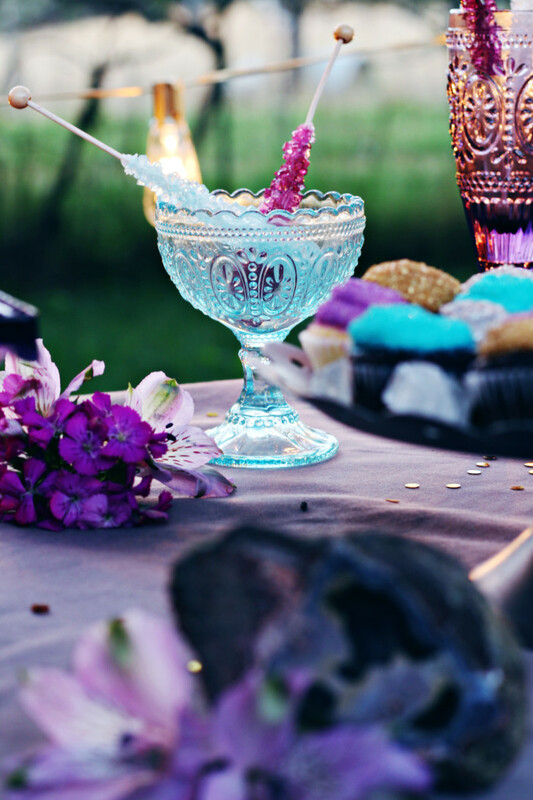 Not only was this party rich in theme and colors but it was pretty decadent in dessert as well! Click through the “read more” button below to see more pictures! I filled the tables with scattered fresh flowers because I wanted to keep that all-natural, earthy feel. So there were no vases at all, just cut flowers filling the gaps. All these amazing geodes were actually collected by my father in law in a place here in Utah. He has a rock saw and rock polisher and everything! Isn’t that neat? I was super thankful to have such a resource once it came to this party! I shared a tutorial for these faux-metal geometric tealight holders a while back and they were so nice to have glimmering about the table. 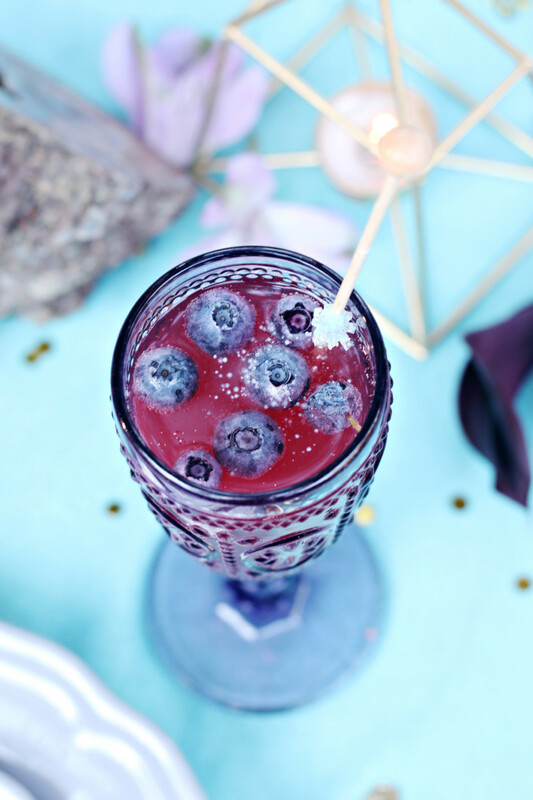 And let me tell you, throwing a rock candy sucker into your drink will make it SO YUMMY. haha! Adds a little bit more sugar to whatever you’re having in addition to looking pretty. 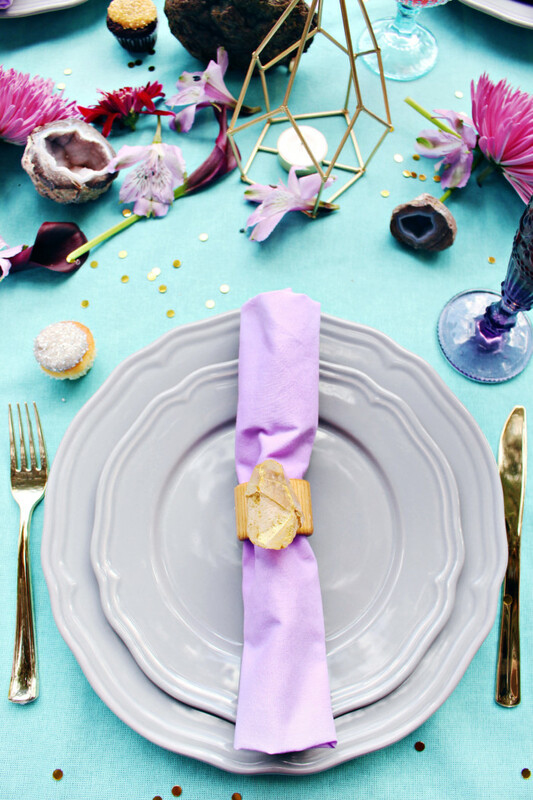 I also shared a simple tutorial for these napkin rings! 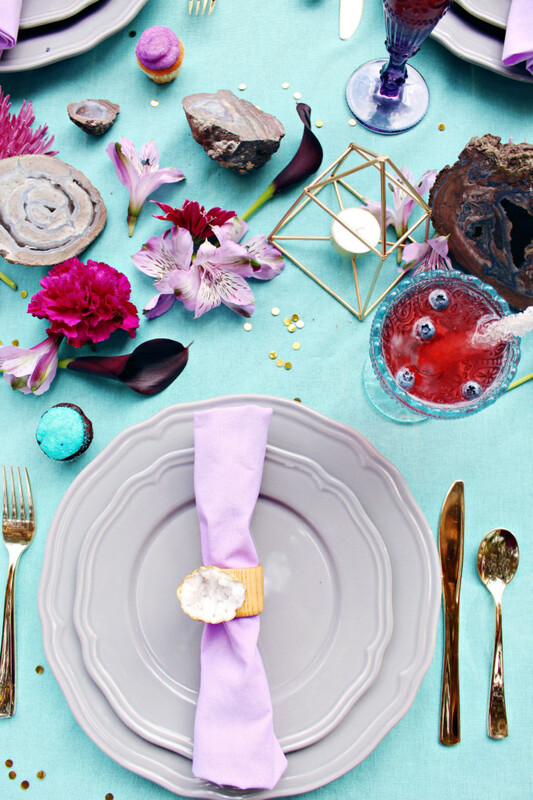 This was honestly my first time ever using napkin rings and I loved what they added to the tablescape! It was a beautiful night and I am so glad I live so close to my parents that it’s easy to have them over for fun things like this! My official life’s goal is to be as great as my mom is at actually getting a party and the food all together before my guests arrive. She has never even made it look one bit stressful and I can say after trying it a few times, I definitely admire her for it! Thank you so much Clarissa!